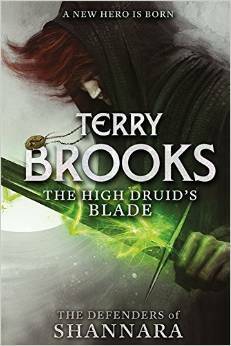 THE HIGH DRUID’S BLADE by Terry Brooks. Paxon Leah is a young man in business; a business that is doing ok, and like everything in life, it is all ok. He has airships to maintain, and since his father’s death a younger sister to help raise. At 15 years old Chrysallin is already growing up too fast. Now she’s gotten herself into trouble again and it will be up to Paxon to get her out of it, as usual. Paxon has the black sword of Leah, but it never did anything for him. Never showed him the magic spoken of in the legends of his family past. Never pushed him to do anything out of the ordinary in his average life. Never did anything but hang in his home as decoration… until now. Among the Leahs, the Ohmsfords, and the Druids in this tale there is a lot of Shannara’s history on the pages, as expected, and the opening of this book serves as an instruction into this world and its key elements, which would make it a good first dip into the works of Terry Brooks for those new to his writing. 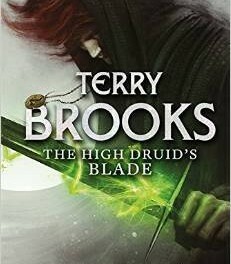 For those familiar with this one of fantasy’s masters, The High Druid’s Blade adds a harsher, darker vibe to the series and delivers a solid dose of a somewhat violent and realistic-feeling behaviour that is more in keeping with modern fantasy fiction. The story takes on a dangerous edge fairly early on, injecting the familiar Brooks’ traits with a little more bite. Paxon may be the usual naïve, trusting Shannara protagonist, reluctantly drawn into a quest, unsure of how to achieve the goal and forced to learn new skills and overcome evils on the way, but the evils he faces are more psychological and as a result seem to connect with the reader in a stronger way. This book sits far more comfortably among the current fantasy landscape than recent Shannara books before it, and its smaller, more tightly controlled cast only aids that.